Yellowstone is BIG, REALLY BIG! Over 2 million acres, covers an area of 3,472 square miles, the park loop road is 114 miles in total. It takes days to see Yellowstone. The best place to see wolves in Yellowstone is Lamar Valley, so today we went to Lamar Valley. From where we are staying in West Yellowstone it is about 80 miles one way due to some of the roads still being closed. This is not 80 miles of Interstate Highway, this is 80 miles of narrow roads with speed limit of 35 or 45 MPH. Not to mention there are bison wandering across and down the roads. When Birding one of the easiest ways to find birds is to drive along until you see people standing around with binoculars and spotting scopes and then to stop and ask what they are seeing. Finding wildlife in Yellowstone is the same way. Sometimes the traffic will come to a stand still because the wildlife is on the road, other times there will be a crowd of people pulled off the road all looking in the same direction. This was the strategy we used to find wolves. The first group of people we saw pulled over and looking through spotting scopes were looking a Black Bear, but they hadn’t seen it for the past 20 minutes so we didn’t stay to see it. 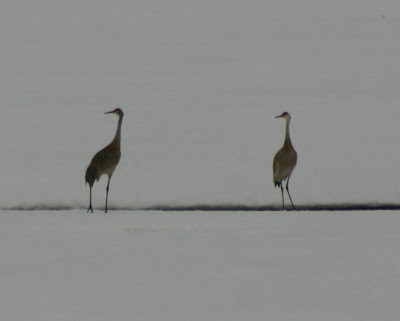 The next group of people we saw pulled over and looking through spotting scopes were looking at a Sandhill Crane sitting on a nest in the middle of a lake. Next we came to a turnout near another small lake with a crowd of people and spotting scopes, just across the lake was a Grizzly Bear sunning himself. While we were there it got up and decided to move on. 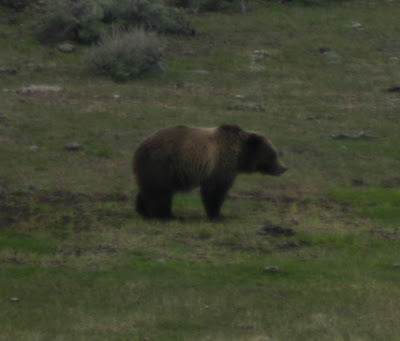 We have seen dozens of Grizzly Bears on each of our Alaska trips, but this is the first time we had seen a Grizzly Bear in the lower 48 states. Further down the road there was another traffic jam and a Ranger trying to direct traffic. He told us that a Black Bear had been sighted just off the road. We asked where we should look for wolves. He directed us to the entrance of a campground that is currently closed call Slough Creek. He said just look for the spotting scopes. Next we came across a turnout with a lot of cars and a group of people up a small hill including a Park Ranger. They were watching two wolves eat an Elk that the wolves had killed earlier in day. Unfortunately these were spotting scope only views and we couldn’t get any pictures. We continued on the road to Slough Creek Campground. When we arrived there were a lot of people and all we saw were Bison. A little further along the road we saw 4 people with spotting scopes so we headed that way. When we asked what they were looking at they told us the WOLF DEN. We stayed there for about an hour and saw 4 different wolves near the den. This is when we found out about “WOLFERS”. Serious Bird Watchers call themselves Birders. It turns out there is a sub-culture of serious wolf watchers and they call themselves Wolvers. They plan their travels around where and what the wolves are doing. They know the different wolves in each of the wolf packs by sight. While we were there a Park Ranger came out to talk to the wolvers. Not only did they know this Ranger but the Ranger knew each of them by name. One of the wolver couples, Allen and Sue, were telling us about spending 4 months last year watching the wolf packs here in Yellowstone. What kind of people have that much free time? Turns out that all three of the wolver couples that we met were fulltime RVers that had retired and now watch wolves. When you go bird watching you are Birding. When you go wolf watching are you wolfing? The wildlife viewing has been GREAT. Apparently the snow melts first near the roads so the grass is greenest there. 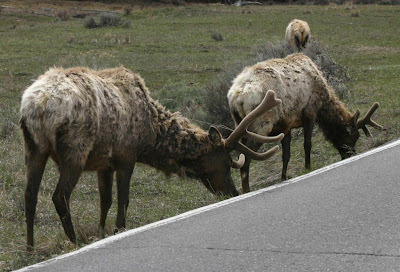 So, the buffalo, the elk and pronghorn antelope are on the sides of the roads or the meadows closest to the roads. 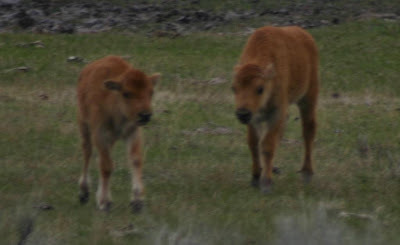 Each day we have had several bison and elk wandering across or down the roads. Today we had 4 pronghorn race alongside the truck in a meadow we passed. We saw a baby bison nursing and several others following “mom”. 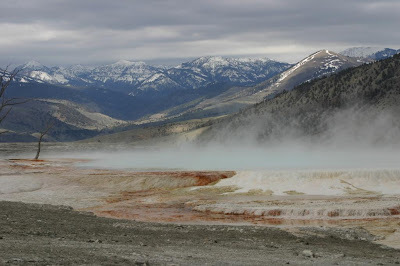 Of course all of the above is taking place in a beautiful place with geysers, thermal pools, rivers, snow capped mountains, Bald Eagles, Osprey, Sandhill Cranes and Mountain Bluebirds all around us. Wow! It just gets better and better. Thanks for sharing!! Yellowstone is my favorite park and I think it's because everytime you go through it's different. That bit about the Wolfers was an eye opener. Wolves really capture the primal imagination, I can see people losing months at a stretch in fascination of them.